Remy’s 3 Questions – Carpet Bomberz Inc.
Remy is collecting our input for the wrap-up of this year’s POSSE RIT. And herein are the answers to those questions. 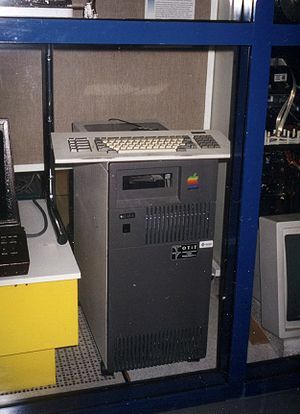 The first IRC server, tolsun.oulu.fi. A Sun-3 server. How does the “The Opensource Way” apply to your course? I’m very impressed with the results of the groups working on software projects we saw in the Commarch presentations. Octave, Sage, Blender and Eclipse in some ways beat the commercial offerings in the sectors where they compete. Given the size of these groups and their ability to work collaboratively over wide distances AND working part-time on some pieces seems like a miraculous accomplishment. There are ways to apply this loose organizational structure I think to other group projects. How will you incorporate what you learned here in your course work? As a desktop support person, maybe the best I can do is to be aware and sympathetic to the Opensource Way. I’ve known students (fewer profs) over the years attempting to use Linux as their regular Desktop OS. So now I think I can be somewhat of an advocate for those folks. I’m definitely as a graphics person much more sympathetic to Blender after watching Ted and Rolando’s presentations surrounding Blender. Any feedback/comments on POSSE RIT itself you would like to add? I want to thank both Chris and Dave for forcing us to use IRC. I have not given IRC nearly enough credit as a tool for collaboration and group projects. So thanks for changing my bad attitude towards IRC. It’s incredible useful and valid and important to this very day. Pingback: Dave’s final questions – POSSE RIT « Carpet Bomberz Inc.